Monday nights and Safe Swimming: Always. They’re back! With the sea temperature around 9℃ and the forecast for a bit of WSW wind, tonight at 6.00pm is the first Myrtleville Monday evening swim of 2015. Last year we had nights where between 5.00pm and 7.30pm over 200 swimmers took to the water. Sea swimming is fantastic, but let’s just have a quick reminder that safe swimming is what it is all about. Never take a chance in the sea. 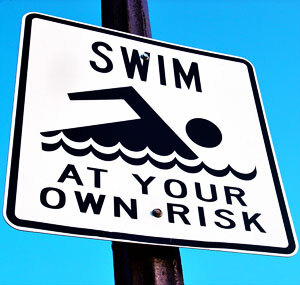 Each individual swimmer is responsible for their own safety. We all swim at our own risk. Monday nights have become so popular because they give an opportunity to swim with others. That’s great, but don’t make the mistake of swimming too far from the beach just to stay with a group. Even in a group don’t go too far out to sea – stay inside (well inside) the line between the Dutchman Rocks and Bunnyconnellan. You don’t ever need to be more than 100m out from the coast – and less is better. Plan your swim. Go only as far as you can comfortably go, while remembering always that you have to get back to where you started. There’s no point swimming 750m to the Dutchman and then struggling back, or needing help. That’s not only pointless, but dangerous. Why not swim 50m or 100m from the beach, then swim back? If you feel good, do it again – as often as you want to and in complete safety. There are always swimmers looking to do shorter distances – just speak up: ask what people are doing, see if it suits you and only do what you can accomplish safely. Over time, you can build up to longer distances, if that is what you want to do. Be Safe – Always. Now’s a good time to read for the first time or remind yourself of some very good advice on safe swimming in Myrtleville. This entry was posted in Information and tagged Myrtleville swim times, Myrtleville swimming, Open water swimming - Cork, Open water swimming - Cork - Ireland, Sea swimming - Cork, Sea Swimming - Cork - Ireland, Swim Safe by myrtlevilleswimmers. Bookmark the permalink.